Far from the crowds of Mount Desert Island and the tourist town of Bar Harbor, a remote section of Acadia National Park can be found on the smaller island of Isle au Haut. 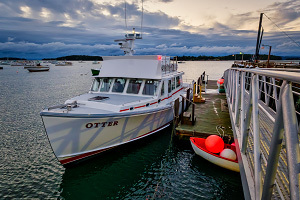 Located roughly 15 miles southwest of Mount Desert Island as the bird flies over the ocean, a visit to the island is via the mailboat out of the town of Stonington. Roughly half of Isle au Haut consists of private residences, but most of the southern part of the island is designated national park land. Visitors should be respectful of private property boundaries and should be sensitive to the fact that people live and work here; the island isn't just a recreational getaway for tourists. Acadia National Park on Isle au Haut is primitive with several strenuous trails that explore the rocky cliffs and coves of the coast as well as the inland forests and peaks. But aside from the ranger station near town and the pit toilets at Duck Harbor, there are no tourist luxuries or amenities whatsoever. A visit to Isle au Haut is for the lonely wandering soul who is looking to explore beautifully rugged and remote scenery. This is not a place for the casual tourist. The first task is to drive to Stonington to pick up the mailboat. If driving from Bar Harbor, it's a 60-mile drive and you should allow 1.5 to 2 hours, depending on traffic. 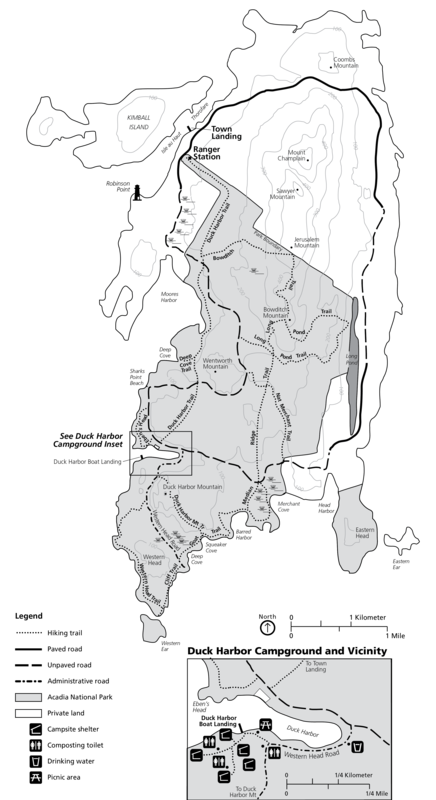 Take Route 3 off of MDI to Ellsworth, and then take Route 172, Route 176, and Route 15 southwest for roughly 45 miles. Near the village of Sargentville, turn right to stay on Route 15 and cross over the impressive Deer Isle Bridge. Route 15 continues south another 22 miles and ends in Stonington at the southern tip of Deer Isle. Isle au Haut is five miles to the south behind many smaller islands. Passenger service to Isle au Haut is run by Isle au Haut Boat Services. Year-round daily mailboat service is provided to the town landing on Isle au Haut, and seasonal service is provided to the Duck Harbor landing within the heart of Acadia National Park. See www.isleauhaut.com for complete schedule listings and rates. 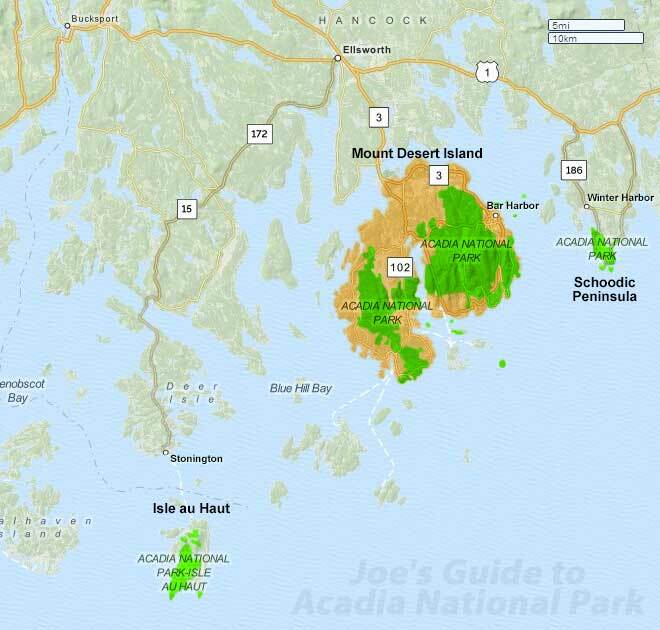 If you get dropped off at the town landing, you can still visit Acadia National Park, but it is roughly a 4-mile hike south to get to Duck Harbor (via the Duck Harbor Trail) and the best of Isle au Haut's scenery. Allow enough time to get back to the town landing so you don't get stranded on the island! During the busy summer months, crowds and parking at the Stonington dock can be an issue. Get there well ahead of your scheduled trip to be safe. Acadia National Park on Isle au Haut has over 20 miles of hiking trails, some that explore the beautiful rugged coastline of cliffs, coves, and rocky beaches, and some that run through the interior of the island along the forested ridges and minor peaks. The NPS map gives a good overview of the island and is an excellent reference to have with you while hiking. 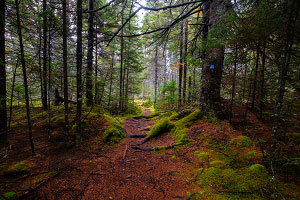 There are no services or amenities and you will be hiking in very remote territory. Bring everything you might need with you: water, food, jacket/fleece, sunblock, hat, rain gear, headlamp, etc. If you are on the island only for one day, spend your time on the south western tip of the island where the scenery is the most extraordinary. 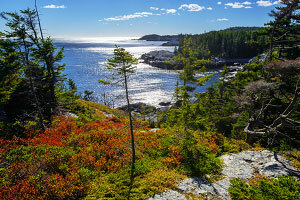 A loop hike up the Duck Harbor Mountain Trail and then along the Goat Trail, Cliff Trail, and Western Head Trail makes for a wonderful day of exploration. If you need drinking water, there is a pump well along the dirt road .2 miles east of the campground. If you bring a water filter, there are many clear streams around the island that run year-round. Camping is permitted only at the Duck Harbor Campground located just to the west of the boat landing. Five primitive campsites are available for reservation in advance by snail mail; no walk-ins are permitted. (See the NPS website for details.) 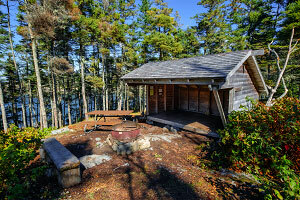 Each site has a fire ring, a picnic bench, and a small lean-to shelter that can accommodate 1 or 2 small tents. (Dead and down wood may be collected for campfires.) Two pit toilets are available onsite, and drinking water is available from a pump well located along the dirt road .2 miles east of the campground. Pack out all trash with you.